In this seventh-grade creative assessment, students work in groups to plan and prepare a meal using a surprise set of ingredients without adult help. Guest judges from the school and local food community observe and evaluate their work, provide feedback to each team, and award honors in various categories. Work independently from adult help and collaboratively with peers to plan and prepare a meal. Progress into the eighth grade with mastery of the tools, techniques, and concepts introduced in the seventh grade. Reflect on their personal level of mastery of the skills and techniques taught in the kitchen classroom and on their own strengths and learning edges. Work with their team, without adult help, to plan and prepare a meal. Demonstrate mastery of the sixth- and seventh-grade Edible Schoolyard kitchen standards for tools, techniques, and concepts. Apply their knowledge of skills and techniques and assess their contributions to the team, including their strengths and learning edges. Print out the Iron Chef rules. Prepare the Iron Chef ballot. Recruit judges and review the Iron Chef ballot. Collect all the ingredients and distribute them to the tables. Cover the ingredients with a tablecloth so they are hidden. Set up the Wild Card table with common pantry ingredients (butter, eggs, yogurt, potatoes, bread, soy sauce, milk, tortillas, rice, cheese, etc.). Meet the students outside the kitchen classroom. Inform them that instead of meeting around the middle table for the Chef Meeting, students will wash their hands and go straight to their table. Welcome students to the grand finale of their seventh-grade experience in the kitchen—the Iron Chef competition! Share the Iron Chef rules and answer questions from students. Introduce the three judges and explain the scoring system. Each judge will observe all three tables and award them a score for each ballot category: group brainstorming and menu planning, safety, hygiene, clean as you go, mastery of kitchen terminology, mastery of kitchen skills and techniques, presentation, taste, and cooperation. Stress that out of all the categories, the majority of points will be awarded for group brainstorming and menu planning, cooperation, presentation, and taste. Explain that after the food is prepared and the table is set, judges will visit each table one at a time, and that the students will eat when the third and final judge visits their group. The judges may ask any manner of questions about the food, so groups should be prepared to talk about the food they make, as well as the process of making it. Judges will tally up the scores while the class busses their dishes. Students will clean all the tools and materials they use for cooking. Teachers will be washing the dishes. At the end of the competition, winners in the individual categories of presentation, taste, and cooperation will be announced along with an overall winner. Tell students they have 45 minutes remaining; unveil the ingredients and begin. Students work with their table groups to brainstorm menu options. Judges observe and take notes. Students divide cooking jobs, collect their chosen wild card items, and prepare their dish(es). Students are expected to clean as they go. Every 10 minutes, call out the remaining time. When the time is up, have judges rotate through the tables to taste the food. Students introduce, explain, and list the ingredients of each dish to all the judges. Students serve themselves and eat with the last judge to visit their group. Students bus their dishes and finish cleaning while the judges tally their scores. Students return to their table to hear the results. Students remain with their teams. Judges give an overview of what they observed and then announce the winners in the categories of taste, cooperation, and presentation, as well as the overall winner. Creative Assessment: This lesson is a great way for us as teachers to reflect on how we’re doing. By stepping back and allowing students to work entirely independently, we are able to observe what they know, what skills they have mastery over, how they work together, and in which areas students have not met our learning objectives. These observations are invaluable to informing our development as teachers. Lost Skills: Over the years, a few of the skills we have noticed students are missing when we get to Iron Chef are: how to turn the stove on, remembering to preheat the oven, how to turn the oven on and set the temperature, knowing where the pots and pans are, knowing where to find extra paper napkins, remembering to use oil or another fat when sautéing, knowing that oil or fat will burn if left in a heated pan too long without any other foods, and a mastery of hygienic tasting technique. When we notice patterns of deficit emerge, we are able to intentionally structure those skills into our lessons the following year. Many of the skills that we find lacking are things that we often do for our students and forget to explain to them what we are doing and why. Iron Chef Ramp-up: This year we developed all four lessons in the 7th grade spring rotation (Tortilla Scramble, Udon Noodle Soup, Maki Sushi, Sauté Roast Steam) with Iron Chef in mind. Specifically, we wanted to support our students in working together well as a team (with a focus on inclusivity, self-awareness as strategies for effective collaboration), and being able to work independently with a variety of cooking techniques. We were very pleased with how this specific lead-up to Iron Chef resulted in teams that operated very capably and collaborated at high levels. We especially noticed how useful the Sauté, Roast, Steam lesson was in helping students gain mastery and confidence with a variety of cooking techniques and effective group decision-making. Ham it Up! The Iron Chef lesson is modeled off of cooking shows on TV. We always ham up the introduction like a TV show, which students tend to find very amusing. Visual Aid: We found that including representations of all the recipes students had cooked throughout the year seemed helpful for jogging students’ memories of recipes and techniques they had practiced. We also put up a simple visual aid of cooking techniques to help students remember their options for cooking vegetables. Reflection Cards: This year we created large versions of the Reflection Card decks from our toolboxes to hang as decorations in the Kitchen classroom. We structured the lessons leading up to Iron Chef to provide opportunities for groups to practice the skills associated with each card, and spent time during each lesson explicitly reflecting on how that practice had gone. These cards became the categories in which Iron Chef teams were evaluated by the guest judges. We liked how this worked because students were already familiar with what they were being evaluated in and were able to refer to the large versions hanging in the room as reminders. Flexible Scoring: This year we didn’t impose a pre-decided structure for how the scoring of Iron Chef would go. Sometimes we awarded each group a ‘win’ in a different category; sometimes we awarded an overall winner; sometimes we included honorable mentions; and other times judges simply provided specific feedback to each group. We liked how this kind of flexibility allowed the scoring and feedback to be judge- and class-specific, resulting in what felt like more meaningful and satisfying learning experiences for our students. Students with Aides: Though the lesson is a chance for students to operate independently from adult help, students with aides continue to work with their aides in this lesson so that they are able to participate fully. 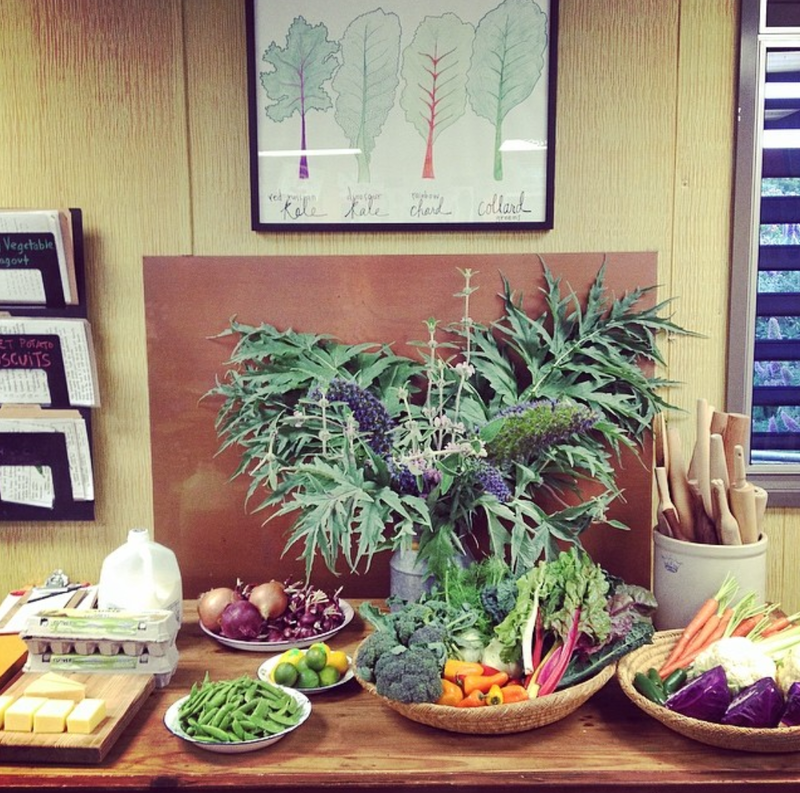 Garden: We give students free access to the garden to harvest flowers and other herbs throughout the cooking period. Judges: We like to have all three judges float for the full class as opposed to staying with specific groups. This helps to adjust for discrepancies in judging style and scoring, and also creates a very enjoyable experience for the judges and students. Judges are always very excited to see all three groups, and the students are excited to get a variety of feedback. Judges and Community-Building: We invite adults from within the school and in the broader community, especially food professionals, to be judges. It is very exciting for students to showcase their skills and share their meals with a variety of adults, and we find Iron Chef is a great opportunity to bring people from the community into our program. Judges tend to have a really enjoyable time and are blown away by how capable middle schoolers can be in the kitchen. Over the years, judges from Iron Chef have become many of our most staunch and devoted supporters. Dietary Restrictions: we always check with our guest judges beforehand about any dietary restrictions or allergies they have. This way we can make sure that all the judges can enjoy the food our students make. Scaffolding the experience: the goal of this lesson is for every student to engage in a fun, meaningful challenge. We vary the expectations and the support we provide to different groups in order to facilitate this. Timing: We aim to have groups finish cooking about a half hour before the end of class. This allows for a leisurely pace while judges rotate between groups trying their food and gives them time to tally scores and give awards and feedback at the end. Performance Anxiety: This idea of this lesson can feel stressful for some students. Each year we work on figuring out ways to be sensitive to that while maintaining the level of excitement and competition that many of our students find so fun. Generally, it is not hard to see who feels stressed when they walk in for class. Check in with them and reassure them that the competition isn’t the important part. In our experience, even students who feel anxious before the lesson begins have a really enjoyable time once it starts. Adequate preparation (both in cooking skills and collaboration skills) is very important for this challenge feeling enjoyable to students. Collaborate to identify, choose, and complete jobs to execute recipes, and explain each individual contribution to the end result. Refine tasting skills and adjust seasoning, compare and contrast different recipes in conversation using more advanced descriptive vocabulary. Understand the versatility of ingredients, and realize that certain ingredients are available in particular seasons. Execute an increasing variety of techniques, begin to choose the correct technique for each job, and discuss reasons to use different techniques.